(Cambridge, Paris, Surrey) The classic Romantic question, “Why am I me and not you?” exceeds distinctions about objects in the world because it builds both reflexivity and otherness into itself; just as I refer to myself all the time and presume other humans be in the world in more-or-less the same way, the question folds the reflexivity that characterizes consciousness into a statement others may think on. That anyone may relate to the question by employing the same mental faculties implies self-definition is interpersonal, at least among humans. However, neuroscientists believe birds and the octopi who preen before shiny mirrored bits and decorate their borrows have consciousness, as well. Thus not only do we currently surmise other humans are conscious because I am conscious (“If I am I then others must similarly be other I’s”) we use certain criteria (or evidence) to label certain animals conscious, according to mental qualities (or representations) they share with us, and perhaps each other. But why does consciousness, that ability to refer to myself as if *other, arise? At MIT, theoretical physicist Max Tegman argues consciousness arises out of a, “particular set of mathematical conditions, that there [denote] varying degrees of consciousness,” not unlike how states of matter vary qualitatively as liquid, solid, gas, as their intermediate meltyness, one may correspondingly quantify transition phases, as well. It is unclear if Tegman uses phase state as an analogy to describe the quantum mechanical probabilities regulating the electrical states we encounter measured empirically in the presence of consciousness, or if the maths of consciousness function as direct analogues we observe in various phase states, as homologues. He observes, though, that the observable electrics are indeed dividable into their ever-smaller constituent units, consequently are calculable, additive, and thus, indicate emergence. How does neurobiology’s seeming employment of a particularly curious dialectic, the ‘expectation’ of Thought become pure Substance operate? “Action divides Spirit into substance, and consciousness of the substance; and divides the substance as well as consciousness… Spirit, is in its simple truth, consciousness… An act divides spirit into spiritual substance on the one side, and consciousness of the substance on the other; and divides the substance as well as consciousness. The substance appears in the shape of a universal inner nature and purpose standing in contrast to itself qua individualized reality. The middle or mediating term, infinite in character, is self-consciousness, which, being implicitly the unity of itself and that substance, becomes so, now, explicitly, unites the universal inner nature and its particular realization” (Hegel, The Phenomenology Of Spirit). In a peripheral legislative move, France has declared dogs sentient non-human persons after approximately 700,000 humans petitioned against the 1804 ‘absurd’ Napoleonic law constructing pets as “movable goods” (i.e. tables and chairs). Minister Luc Ferry asserts: “No one has ever tortured a clock. Animals suffer. They have emotions and feelings. It is not a question of making animals subjects of the law… but simply of protecting them against certain forms of cruelty.” Meanwhile in Surrey, local cat Oscar suffered indignity and improbable maiming, his feet clipped off by a wheat thresher, apparently while he dozed in some idyllic field. His humans, Kate and Mike Nolan reasoned, “We had to do a lot of soul-searching and our main concern has always been whether this operation would be in Oscar’s best interests and would give him a better quality of life,” so ultimately chose the innovative surgery that attached prosthetic kitty feet to his cleanly clipped stubs. The three hour operation required drilling into the bone amputation site, affixing pegs, clipping on the prostheses, and growing an umbrella of epithelial cells around stump/peg suture. The cat lovers state, “Oscar can now run and jump about as cats do,” or, as is a cat’s nature. 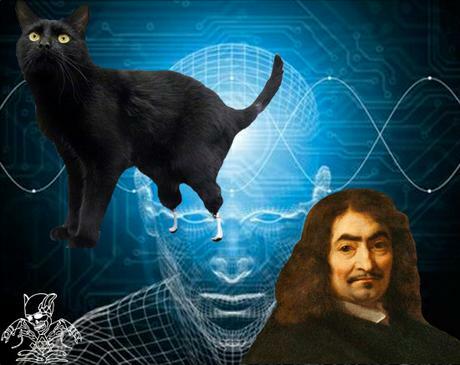 Notably, these dilated episto/ontological and ethical categories: consciousness as state of matter, dogs as non-human persons, and cat prostheses could confound local Object Oriented Ontologists and Kafka enthusiasts alike.